Replaces stock seat mounting system under your seat. Attaches to your stock seat. Lowers seat about one (1) inch. Seat retains its fore and aft travel. 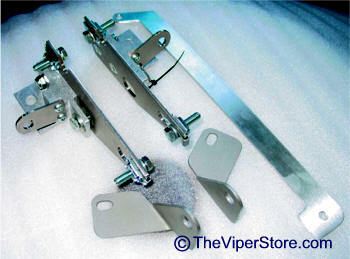 High quality sturdy all metal product produced in America. Replaces stock seat mounting system under your seat. Attaches to your stock seat. Lowers seat about two (2) inches. Seat will be in a fixed non-adjustable position. High quality sturdy all metal product produced in America. Where is seat fixed at? 2003-2010 Vipers: 2-in. drop, fixed position kits do NOT place the seat as far back as the factory slider allows. The seat is placed approximately 3-in. forward of the most rearward position of the factory slider. Each kit consists of (2) stainless steel welded parts and (2) alloy assemblies that attach to the existing floor mounts and are NOT adjustable.